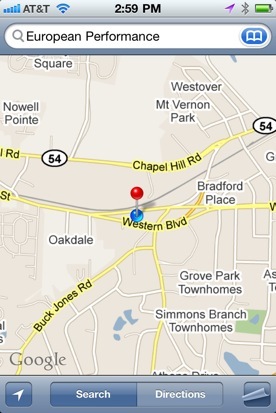 Our building is located on Hillsborough Street where it merges with Western Blvd, next door to Hardees. We are less than a mile from the PNC Arena, State Fairgrounds, and Wake Med Soccer Center. For a map and directions to the shop please click on the image of the map. If you like what you have seen and need to have your car serviced we would love to hear from you. Instead of just dropping by, although we would love to see your smiling faces, please call ahead or email us to schedule an appointment. Depending on the volume of services that we have scheduled on any given day, it is very possible that we may require you to drop your vehicle off. If that is the case we will gladly give you a ride to where ever it is that you may need to go, as long as its local and within a reasonable distance from our shop. If you are scheduling due to a problem with your vehicle that needs our special attention please give us as much information regarding the problem as possible. The more information that we receive from you, the faster and more efficiently we can find the fix. Below is a list of questions to consider before calling or emailing to better inform us of your situation. - When did you first notice the problem? - How often does the problem occur?